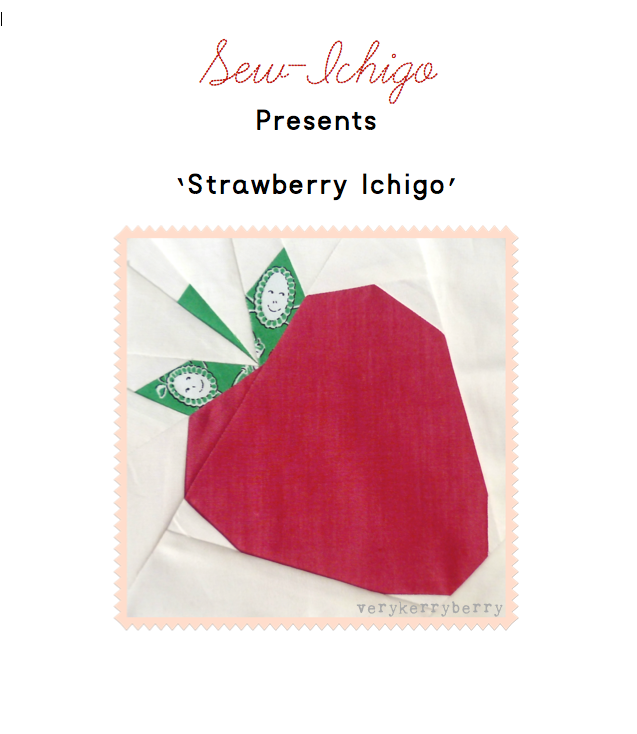 sew-ichigo: Would you like strawberries with your coffee? Would you like strawberries with your coffee? Penny and I have sneaked out a couple of new patterns, both aimed at paper piecers with little or no experience. 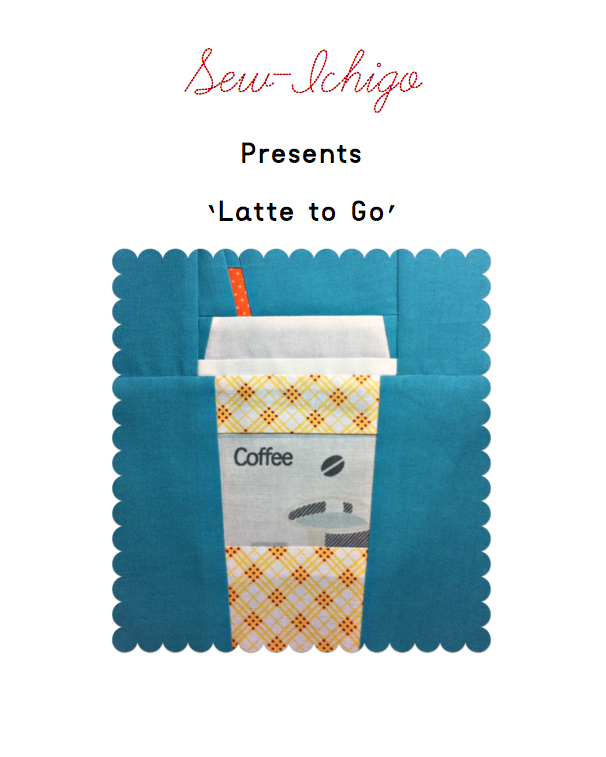 Penny was inspired by the simplicity of take- out coffee cup shapes so we present, 'Latte to go'. This is a great beginner pattern, there are no seams that need to match up exactly and the pattern sections are straightforward. 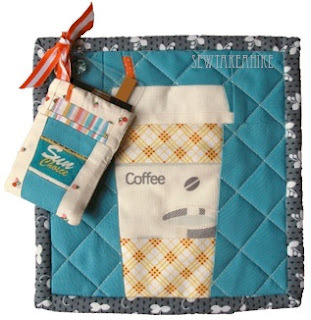 She has made a cute mug rug with an ingenious gift card holder using a scaled down version of her pattern. A tutorial will come soon giving guidelines on how to make these. And I was inspired by a beautiful stack of ruby shot cottons sent to me by the kind folks at Oakshott Fabrics. The variying reds screamed 'Strawberry' at me so we present, 'Strawberry Ichigo'. This is aimed at a beginner with a little paper piecing experience. Only one seam needs precise matching so there is room to learn on this pattern. Using solid colours and shot cottons makes paper piecing easier as you don't need to worry about which side of the fabric you are working on, both sides are the same! 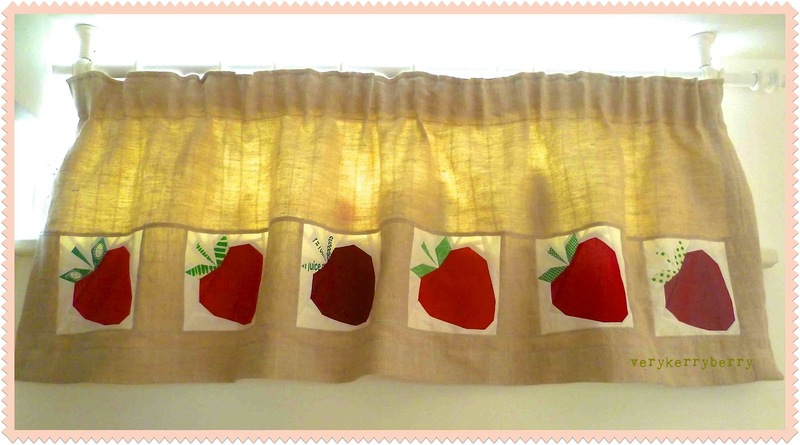 I made a kitchen curtain for narrow window with six Strawberry Ichigo blocks, each in a different Oakshott ruby red. I'll post a few details on that too. So, if you have been a little nervous about trying paper piecing, these patterns are for you. They both make 6 inch finished blocks and are easy to enlarge as all the pattern pieces come on one page. With have included some extra instructions about which seams to press open and the order of piecing. You can find both patterns in our shop and at our Craftsy store. I've done a bit of paper piecing ~ love these ~ beginner or not! I always wonder if some people are scared of paper piecing but want to try- hope to entice them in! Lovely...but your strawberries need some seeds. Try adding a little embroidery. I thought about that but for the curtain I thought it might look a bit crazy with yellow thread everywhere. I would love it on a pot holder with french knots for the seeds! If you do one Cindy, send us a pic! Such cuteness! Love both patterns!!! the strawberries are too cute! Kerry did a fab job designing it! Both fab patterns, and love their ultimate destinations too! thank you Katy! I love Kerry's curtain and the Latte to Go seemed to be begging to be a mug rug! Both such cute patterns. I have a long list of things to make (your buttons and spools are on the list) Look forward to trying these too! I think the mug rug would make a perfect teachers gift!! Thank you so much Charise! That means so much coming from you!! And I agree about the mug rug as a teacher's gift! i need the latte pattern. my sisters would love to have some mug rugs oooooh! or i could make some coffee cozies! smart smart smarty pants! ha! and it is mine! yay! Looking forward to seeing your coffee makes! Love, love, love these patterns and the projects you both made with them! I looooooove the new patterns!! They are adorable! But I have a question for you, Kerry! Does the Oakshot red fabrics bleed? I have had a huge problem with red fabrics, I have bought them from several manufactures (Robert Kaufman, Michael miller, Moda, etc) and almost all of them bleed. And as you know, I love to use white backgrounds for my works! All the cotton hanks are boiled washed for 8hrs+ to remove any impurities in the cotton. Then the yarns are manually dyed ( using vat dyes ). These are then washed, sundried,and then woven. The vat dyes are a chemical group that provide the best all round fastness ( light, rubbing and washing ) to cotton. It is therefore not necessary to pre-wash but some customers do as a matter of choice or habit. If the fabrics are to be washed then it is important to avoid any contact with chlorine and the water should be less than 40C. Its best to iron the fabrics when damp.Washing will not affect the lustre. A good customer in Western Canada tells me that in her region everyone buys some special prewash soap. I think that's all just good marketing ! Ruby Reds and Lipari use gas mercerised yarns both woven on fully automatic power-looms. The dyeing of these yarns is even more fast than above as they have been pressure dyed using the very latest of equipment. Again pre washing is not necessary. In the last 12 years we have only had one very minor problem with colour bleeding. You are very nice answering me so quickly and with an explanation very interesting! I will buy some Oakshott reds to use in my works! Thank you so so much for your kindness!! thank you! We are very excited about them!